^ GB/T 7408-2005 数据元和交换格式 信息交换 日期和时间表示法. 中华人民共和国国家质量监督检验检疫总局、中国国家标准化管理委员会. 2005-03-28. ^ Guinot 2011, p. S181. ^ 5.0 5.1 McCarthy & Seidelmann 2009, p. 227. ^ ITU Radiocommunication Assembly 2002. ^ Time Service Dept. c. 2009. ^ National Institute of Standards and Technology 2012. 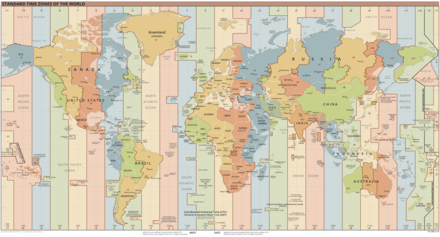 ^ Why is UTC used as the acronym for Coordinated Universal Time instead of CUT?. [12 May 2010]. （原始内容存档于2010年7月26日）. ^ IAU resolutions adopted at the XVIth General Assembly, Grenoble, France, 1976 (PDF). 1976. Resolution no. 3 by Commissions 4 (Ephemerides/Ephémérides) and 31 (Time/L'Heure) (near the end of the document) "recommend that the following notations be used in all languages", UT0(i), UT1(i), UT2(i), UTC, UTC(i), UT, where (i) is institution "i". ^ ITU Radiocommunication Assembly 2002, p. 3. ^ International Earth Rotation and Reference Systems Service 2011. ^ McCarthy & Seidelmann 2009, p. 229. ^ McCarthy & Seidelmann 2009，chapter 4. ^ History of TAI-UTC c. 2009. ^ McCarthy & Seidelmann 2009, pp. 217, 227–231. ^ Howse 1997, pp. 133–137. ^ McCarthy & Seidelmann 2009, pp. 10–11. ^ 19.0 19.1 McCarthy & Seidelmann 2009, pp. 226–227. ^ Nelson & McCarthy 2005, p. 15. ^ Nelson 等人 2001, p. 515. ^ Essen 1968, pp. 161–5. ^ Seidelmann 1992, pp. 85–87. ^ Nelson，Lombardi & Okayama 2005, p. 46. Guinot, Bernard. Solar time, legal time, time in use. Metrologica. August 2011, 48 (4): S181–185. Bibcode:2011Metro..48S.181G. doi:10.1088/0026-1394/48/4/S08. McCarthy, Dennis D.; Seidelmann, P. Kenneth. TIME From Earth Rotation to Atomic Physics. Weinheim: Wiley VCH. 2009. ISBN 978-3-527-40780-4. ITU Radiocommunication Assembly. Standard-frequency and time-signal emissions (PDF). International Telecommunications Union. 2002 [2 August 2011]. Time Service Dept. Leap Seconds. United States Naval Observatory. c. 2009 [17 July 2011]. National Institute of Standards and Technology. Frequently asked questions (FAQ). 19 March 2012.
International Earth Rotation and Reference Systems Service. IERS Bulletins. 19 July 2011. History of TAI-UTC. Time Service Dept., U.S. Naval Observatory. c. 2009 [4 January 2009].